How much do you really know about how chicken meat is produced in Australia? We've demystified the process in no-nonsense terms to help you make truly informed choices. How much do you know about how chickens raised for meat are really treated? The modern phenomenon of 'cheap chicken' has come at an enormous cost to the animal and constitutes the world's biggest animal welfare disaster, with 50 billion chickens raised intensively for their meat annually, worldwide. Chickens have been selectively bred to grow three times their natural rate, impacting significantly on their physical well-being, as this rapid growth puts enormous pressure on their hearts and immature skeletons. 20 million chickens die in sheds every year in Australia as a direct result of how they are being farmed. It is important to note that this fast growth rate is common across all chicken production systems — whether factory farmed or free-range. The key differences between systems that do attempt to provide a higher standard of welfare for these birds are clarified below. NOTE: Current demand for chicken meat in Australia can only be met by factory farming. But this demand never would have existed if people knew the truth about how animals are being treated. Now that you know, the power is in your hands. Refusing factory farmed products is an important first step. But to end factory farming, animals urgently need caring consumers to also make the choice to consume less animal products. Every person who replaces some or all of the chicken meat they eat with animal-friendly alternatives helps reduce the demand that has forced animals to be so intensively farmed, bringing chickens a step closer to a world without factory farming. With no consistent or legally enforceable definitions for chicken production systems in Australia, it's not easy to understand what the various logos and terms on packaging mean. Below we have attempted to demystify chicken production and in doing so assist more people to make kinder choices to help these animals. Note: If the production system isn't specified on the packaging, the chicken was almost certainly factory farmed. It is important that consumers are aware that there are ethical and welfare issues common to all chicken farming systems – including certified free-range and certified organic. On their first day on earth, tiny chicks are assessed for 'viablility'. Chicks deemed 'unviable' will be either gassed to death or 'minced alive' in industrial ‘macerators'. Millions of day-old chicks are killed this way every year in Australia, and this practice is not only entirely legal but routine across all farming systems including 'free range'. 'Viable' chicks will be grown in huge sheds and killed only a few weeks later. They will be transported and slaughtered in similar facilities at a young age, when they are in fact still just juvenile birds. When they reach 'slaughter weight' birds are commonly handled roughly during the catching process, which is done under time pressure. They are grabbed by the legs and stuffed into transport crates with hardly any room to move. Many birds may have bones broken in the process. During transport – which can be many hours non-stop – they can be exposed to weather extremes. At the slaughterhouse, their last glimpse of the world will be hanging upside down with her feet shackled in metal stirrups. Their heads will be drawn through an electrified water bath to stun them unconscious (some slaughter plants now use a gas immersion killing system) before an automatic knife cuts their throat. Some birds are not so 'lucky'. Those who raise their heads and miss the electrified water bath face the throat cutting machine while fully conscious. As consumers become aware of the ethical issues relating to chicken farming and slaughter, more and more are choosing cruelty-free alternatives, which are readily available in most supermarkets. 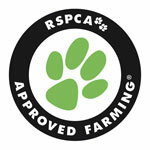 The RSPCA Approved system accredits chicken farms to RSPCA standards. Chickens on these farms can be raised in either a free range or indoor system. Chickens in an RSPCA Approved indoor farm have no access to an outdoor area. However, the welfare standards are higher than in conventional factory farms. Freedom Farms products come from chickens raised on an RSPCA Approved indoor farm. Unfortunately, there is no legal definition of the term free range in Australia so standards between farms can vary. These logos on the packaging indicate that the chickens were raised on farms with access to an outdoor range. * Note: The RSPCA Approved logo alone does not guarantee outdoor access - you may also find the RSPCA Approved logo on chickens raised in an indoor housing system that conforms to RSPCA welfare standards. Only RSPCA Approved products that are also labelled 'free range' come from farms where the chickens were raised with access to an outdoor range. Certified organic chicken products come from chickens kept on farms which exceed standards in the best free range facilities. However, simply the word 'organic' on packaging can sometimes mislead people to think the welfare of chickens meets certified organic standards - when it may simply mean that chickens are fed organic feed. These logos on the packaging indicate that the chickens were raised on a certified organic farm. Providing chickens with proper dark periods is associated with many welfare benefits compared to near-continuous light systems. Natural light and dark cycles are important to stimulate activity in chickens and for the development of a circadian rhythm. Continuous light on the other hand may increase physiological stress by disturbing sleep and cause sleep deprivation. Incidence of leg abnormalities, such as lameness, and metabolic disorders have been found to be lower among chickens provided with dark periods. The Organic Growers of Australia is the only certification that does not allow the use of artificial light to speed up weight gain. Other organic certifications allow lights to be used for up to 16 hours per day; while RSPCA certifications allow 20 hours; and factory farms may subject birds to up to 23 hours of artificial light per day. Maximum allowed indoor and outdoor stocking densities are commonly expressed in total bird weight per square meter (kg/sqm). For the table we have translated this to number of birds per sqm based on an average slaughter weight of 2kg. Chicken breeds used in the chicken meat industry are selectively bred to dramatically increase growth rate. They grow up to three times as fast as they would naturally. This fast growth has widespread and severe negative welfare impacts on the birds*, causing debilitating physical problems ranging from heart failure to lameness and results in millions of birds dying in sheds every year before they even reach slaughter age (up to 20 million die in sheds each year in Australia). There are many other phrases and terms used on chicken products that may be perceived to suggest higher welfare such as 'raised in large barns', 'range reared', 'corn fed', 'grain fed', 'chemical free', 'Australian chicken' and 'Australian made'. The majority of these do not signify a higher standard of welfare than factory farmed chicken. If there is no certified free range, certified organic or RSPCA Approved logo on the packaging, the chickens have almost certainly been raised in factory farms. A common claim by some in the chicken meat industry is that the chicken was raised 'cage free'. However, chickens raised for their meat are never raised in cages, regardless of the production system (only hens kept for the production of cage eggs are kept in cages). This claim is deceptive in making people believe that what is on offer is a 'better welfare' product. If there is no information provided that the product is certified free range or certified organic, 'cage free' chicken almost certainly comes from factory farms. 'Free to roam' is another term used by producers of factory farmed chicken meat - suggesting that the birds have plenty of space. But the Australian Competition and Consumer Commission (ACCC) is fighting this claim in court, alleging that it is misleading or deceptive advertising as the birds in factory farms are confined at such high densities inside sheds that they cannot roam around freely.